The Pro Air Jersey has been engineered for high performance riding in hot conditions; The lightest and coolest of our Le Col Jerseys. The Pro Air jersey was born to minimise heat retention on the hottest of rides via a reduction in fabric thickness. Maintaining the same aero technical performance cut as the main Pro Jersey the Pro Air Jersey fit still favours the competitive on-the-drops riding position but has the lightest fabric and highest airflow of any Le Col jersey providing maximum breathability and ventilation. The Jersey comes in our new bright and bold 'hot summer' colours. This Pro Jersey is Pro Racewear available to all. 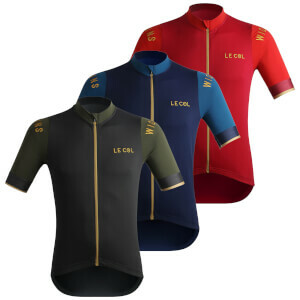 The Le Col Pro Air is an elite performance jersey for intensive efforts in hot conditions.